"I show how wonderful it is. I bring passion to it." Her students have noticed. The top three in her Grade 10 math class at Sir William Mulock Secondary School have marks of 97, 96 and 95 per cent. They are all girls. In countries like Korea, where boys are favoured and women are not seen as equal to men, fewer girls are enrolled in school than boys. The myth that girls are not as successful in math has persisted even though data accumulated over the last two decades have shown the gender gap in math achievement has been nearly eliminated in countries like the United States. When the former president of Harvard University, Larry Summers, suggested in 2005 that a biological or genetic mechanism might account for the underrepresentation of girls in science, researchers were spurred to review the literature, Else-Quest said. "There's nothing to support that. When we studied cross-national patterns, it pointed to cultural forces." 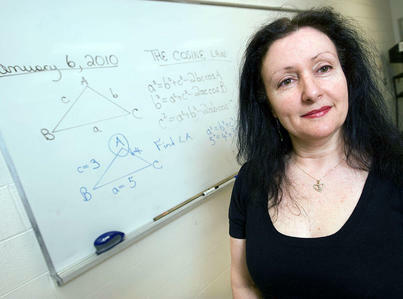 In Newmarket, Catalano-MacPherson, a teacher for 28 years, has noticed more girls are enrolling in advanced math classes. Her enthusiasm and success as a female math teacher (and role model) have helped. As well, she teaches math in a girl-friendly way. Instead of abstract analysis, likes to use real-life examples from the world the girls inhabit. One problem she presents to her class begins with a building her students know – it's part of the local hospital, the Southlake Regional Health Centre. She asks them to create an equation to calculate the building's parabolic curve using data points and a graphing calculator. "This is something they can visualize," she says. "They loved that." She also engages her students by asking them to solve mathematical problems related to the environment; for example, giving them data to calculate how much recycling is being done in the Toronto area. Still, girls' university enrolment in the so-called hard sciences and engineering is markedly low. According to the University of Guelph, women make up 17 per cent of undergraduates in engineering and 9 per cent in computer and mechanical engineering. In her research paper, Else-Quest suggested girls could be discouraged from pursuing high-level math if they perceive it won't lead to "appropriate" career opportunities for them. "She may see math as less useful or valuable and may think she is not capable of doing math." She adds, in an interview: "If you look around and see only men become math teachers and scientists, what's an adolescent girl going to do? Obviously, she'd say, `that's not for me.'" Success in math is also linked to girls' beliefs in their own abilities, beliefs that can be nourished at home. "If they believe they are not as good at math as boys, they feel anxious about their abilities," says Else-Quest, "so they don't pursue those paths despite the fact that they are capable." That makes good role models like Catalano-MacPherson all the more important. Says Else-Quest: "It sends a message to girls that math and jobs in math are something they can do."